Architect Daniel Libeskind starts each day by listening to music. "It's not...a luxury, it's almost a necessity," he told Weekend America's Gideon D'Arcangelo. "And it's not background.... I sit down, when I have time, and mostly I do have time early in the morning, just to listen to music." He describes his morning music ritual as "the equivalent for the soul [of] what running and jogging would be for the body... [The] soul also needs to be fed. Otherwise it's empty. " On one morning's playlist: Fugue #22 from Bach's Well Tempered Clavier played by Glen Gould, Cab Calloway's take on "Saint Louis Blues," and a free-jazz improvisation by pianist Keith Tippett. 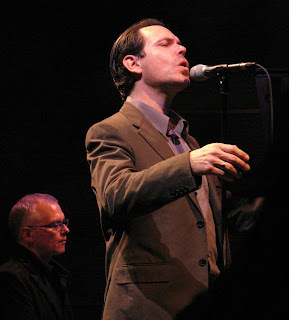 For a while, I began each day with "Resolution," Kurt Elling's vocalese to the John Coltrane tune from A Love Supreme. It's mighty music with mighty lyrics, including prayers to God, Buddha, Allah, Lama, Jesus, and Vishnu. I've heard Kurt perform this live maybe three times, and each time it knocked me silly. Read the whole Weekend America story and a list of songs listeners have submitted as their favorite day-starters. Hear Elling sing "Resolution" and read his lyrics. Hear Elling talk about "Resolution."